Doctor’s Office needed a brand new website to go along with their brand new restaurant located on Anna Maria Island. Formerly a doctor’s office, owner Sean Murphy wanted to keep the tradition alive of providing islanders surcease from woe, anxiety and suffering, by offering quality crafted cocktails. This website uses many of the premium features of our theme we developed for WordPress; including full-width content blocks with photo backgrounds, a transparent top header with a full page ‘hero image,’ and beautiful, updatable restaurant menus. We also provided training to the restaurant staff, so that they may easily update and manage the website (such as menu pricing), themselves. Since this restaurant wanted to attract new clientele, we made sure to target specific keywords on each page for local Search Engine Optimization. The website is fully responsive (mobile-friendly), which is important for both easy accessibility on phones / tablets as well as for Google rankings. 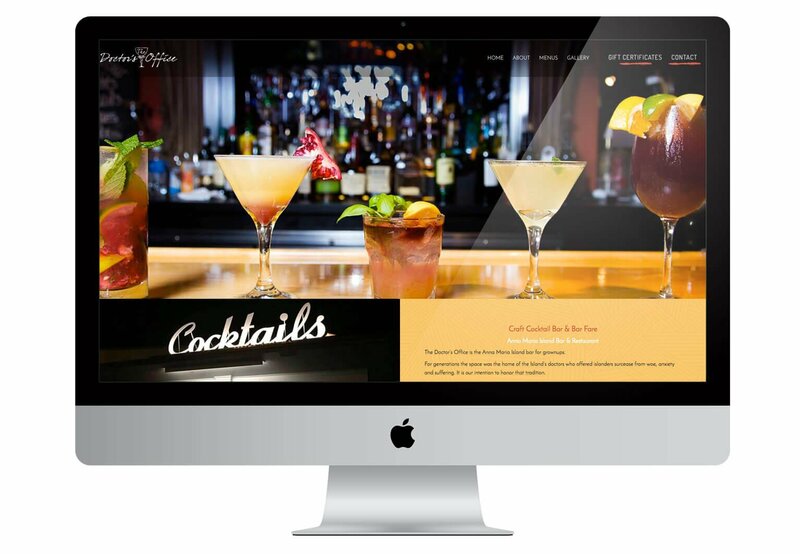 The home page features quick links to the cocktails, beer, food and wine menus, and each page has a Call to Action, so that visitors may quickly contact the restaurant for questions or reservations. We also set up branded social media accounts, such as a Facebook business page and a Google Plus page, for SEO.